By themselves, capturing footage on a GoPro camera (be it some parkour daredevilry or some sweet snowboarding stunts) and flying the latest iteration of drone technology are already incredibly addictive. One has spawned a new era of action footage while the other has transformed the remote control hobby from a niche pastime to a global phenomenon. But what happens when these two worlds collide? What happens when you want to mount that sturdy little camera on your flying bot of choice? The answer is some pretty insane movies shot all the way up in the heavens. If you're looking for a drone that's safe, sturdy and easy to fly, then the Phantom 2 from DJI is the gizmo for you. GoPro cameras aren't exactly cheap, so when it comes to strapping one to a flying bit of tech, you need to know that expensive eye is in good hands. The Phantom 2 is easily the most robust drone you can buy on the commercial market and even comes pre-tuned so all you have to do is affix the propellers, attach the battery, mount your GoPro and voila - your drone is ready to fly. The 3-axis gimbal offers some really versatile camera angles, while the 25 minutes of flight time makes it the best choice for longer, outdoor-based sessions. There's also some ace safety features, including a 'straight to home' utility that will send it zooming back to safety should you lose control or have it disappear from view. However, there is one small caveat - the Phantom 2's custom gimbal only supports GoPro Hero models so you'll need to have a more recent iteration of the camera to ensure its compatible with the Phantom 2. Interested, you can get your hands on one here. The Blade 350 QX3 is all about bridging that gap between simplicity and an affordable price, and it manages to offer a robust little package that's perfect for carrying lighter cameras over shorter distances. It's compatible with most types of GoPro, so it's gimbal (which is included with the drone) should hold your camera nice and firm while out on manouveres. Its small battery only offers 15 minutes of flight time on a single charge (that's the equivalent of around 300m), but its simple controls, GPS antennae (for more precise movements), pre-planned flight paths and straight to home feature (which sends the drone back to its starting point) make up for that drawback. If the Blade 350 QX3 has piqued your interest, you can pick one up here. Touted as the first proper smart drone, the Solo Quadcopter from 3DR is one exciting bit of kit if you're looking to capture footage with versatility and style. Unlike most of other drones on the market, the 3DR Solo was designed specifically for capturing footage with the latest GoPro cameras, meaning every feature has been fine-tuned for aerial camerawork. It can stream in HD direct to your phone or tablet via Wi-Fi, offering seriously crisp footage on the fly. There's even features that enable you to lock onto a single object/person and perform wrap-around shots or affix your drone to a virtual cable (a bit like an autopilot, enabling you to control just the camera for the perfect shot). Being able to shoot in FPV (first-person view) without having to buy any extra bits of kit, makes this drone one serious gadget. Want to go Solo? You can find one here. Versatile and lightweight, the Elite and Power Editions of the Parrot AR drone is an idea choice for GoPro users looking to shoot footage both indoors and outdoors. It offers an impressive 36 minutes of flight time, although this figure will more than likely drop once you add on the weight of a gimbal and GoPro camera. You can also perform 360 degree flips, meaning it's ideal for stunt moves as well as GoPro capture. The Parrot AR also does away with traditional analogue controllers, opting for a bespoke app instead. Controlling your drone via the gyros in smartphone or tablet may seem a bit faddy, but it's actually surprisingly easy to use. That app, AR FreeFlight, is available on both Android and iOS and with its handy virtual joysticks you'll be able to capture the perfect shot with a direct feed. You can buy your very one drone here. The latest drone from Hong Kong-based manufacturer is a big upgrade from its earlier versions of the X350, offering an impressive 23 minutes of flight time and a G-2D gimbal included as standard. You can record in FPV and live stream that footage direct to the radio controller, making it perfect for shooting footage with the angles you want. It comes pre-tuned right out of the box and has been redesigned with GoPro cameras in mind. The GoPro friendly mount (also included in the package) enables you to get your flying companion up in the air in no time, without the need to re-calibrate. Walkera are really trying to compete with the DJI Phantom 2 and the 3DR Solo with the QR X350, and it's a big upgrade on its previous efforts. You can fly one away here. Originally crowdfunded via IndieGoGo, the Ghost Drone is one of the most versatile drones on the market. Much like the Parrot AR, the Ghost Drone drops the traditional analogue remote controller and opts for a live feed direct to your smartphone or tablet. 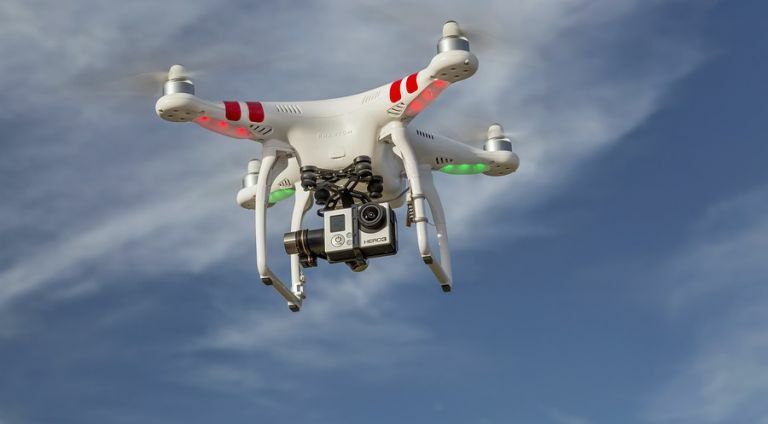 It's designed to carry relatively lightweight cameras such as the GoPro series, although some models may reduce its impressive 25 minutes of flight. The Ghost Drone isn't short on features either. There's a special night mode that uses a series of LEDs to keep your new drone visible in low light, and a track and follow mode that will enable the drone to track your movements as it follows you and your smartphone. Perfect if you want it to track some parkour sessions or a slope-based adventure on a snowboard without the need to strap your camera to a selfie stick. If the Ghost Drone has gained your attention, why not check out our guide to the best drones?